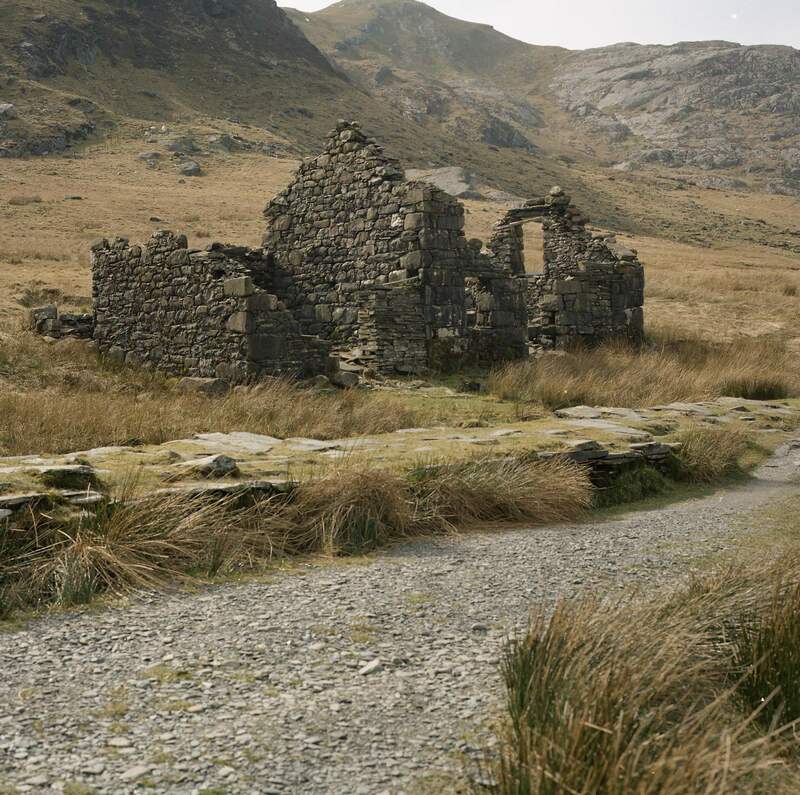 I often visit Cwmorthin – a ruined slate mining village in a valley just above Tanygrisiau. I’m working on a poetry sequence on this place, examining links between landscape, architecture and emotion and it is a place that continually draws me back. When I reach the top of the hill, I turn and look down over the ruins dotted around the lake. It is hard to imagine this place vibrating with the sounds of iron being hammered; trucks thudding along tracks; men shouting orders in the fast, guttural consonants of an endangered language; men coughing, each dust-filled heave tearing at their lungs; mules braying; the rhythmic chip and clink of slate being hewn or rived; the spray and hiss of water hosing down slate or churning in wheels; the occasional muffled boom of an explosion somewhere inside a tunnel. It is hard to imagine the smells: the sulphur and tar tang of coal burning, the gritty alkaline of dust and slate particles choking the air. It is hard to imagine the swell of activity in this place that was a little taste of hell, now transformed to a place of wild tranquillity: uncompromising, but beautiful. There is no odour of industry, the air is cool and clean; the sharp iron tang of snow in the winter, the soft pungency of damp grasses for most of the year. The lake is quiet, an occasional lap of water on stone, but from here it gives back only silence. The sounds now are of an occasional bird calling, my own feet scrunching across the dry, springy heather, and the wind, which waxes and wanes in a fast repeating cycle; howling, keening, whistling before it suddenly falls away, exhausted and still. In those moments the hush spreads a blanket over the ruins: the barracks and lakeside workshop, roofless and fast becoming grim, eroded shapes of decay; the chapel, known as the sheepfold, with its roof newly disappeared, its walls still reaching towards heaven in one last push; the little cottage, the only intact building which I have a constant longing to save, mourning as the first roof tile falls away, knowing that inside the damp is winning, the stairs are already rotten, that no-one will ever sit on the step in a moment of sunshine, watch the water play with stones on the shore, gaze up into the oddly out of place, but pleasing monkey-puzzle tree and think, this is where I live. Cwmorthin now is such a place; a haven where nature has won, where walkers can sit by a calm lake surrounded by the imposing grandeur of the Moelwyns and measure their own existence. There is some truth in this, but it is also a fiction; a narrative we weave to give meaning to loss or progress or the mixture of the two. There are no cabans now; the ‘private groups’ where men met at lunchtime in the mine to debate politics and life and practice hymns The area was depopulated in the late 1970s and has never recovered; jobs are scarce, skills scarcer, economic depression commonplace. But, of course, it was never a fair trade – political engagement and skill should not have such a high price – men coughing their lungs to destruction, frequently dying in their early forties, children fetching and carrying in mines at ten, working full-time by the age of twelve, women carrying unbearable domestic and emotional loads, often with the need to make extra money as well. That something is lost and gone does not mean it should be hallowed and sanctified. The mine at Cwmorthin was known as the ‘Slaughterhouse’ – hardly a place or way of life to feel romantic longing for. But harsh conditions invariably wake the human spirit to acts of resistance. ‘Resistance,’ Alice Walker tells us in her remarkable novel about, among other things, the horrors of female genital mutilation, ‘is the secret of joy.’ What we should be nostalgic for is not the hard, grinding labour or stink of toxic industry, but a quality of engagement with life that Cwmorthin threw up in the face of overwhelmingly harsh conditions; a quality that other times and places might nurture and cultivate in other circumstances, even sitting by a tranquil lake meditating on the depths of existence. A great deal has been lost in this wild, beautiful place, but there are people here who are trying to live deliberately, who do not have economic wealth, but front the essential facts of life – it is part of what makes this small place so dear and an ideal place for a small press. The one remaining house is closed: windows boarded, padlocks guard the doors. Inside, unseen inhabitants, their lives already past, are yet alive and dead—until the seal gives way to break the spell. We know that they are gone, the dead, not smeared into some living-dying-life-inside-the-box; not caught between—but do not know the how or when the murk of maybes became death. And in our box we wait until the measurement is made.